Nice in system neutral version as well! 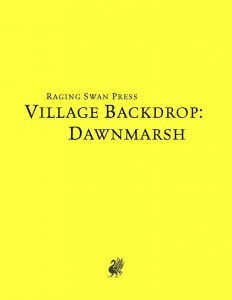 This installment of Raging Swan Press‘ Village Backdrops-series clocks in at 13 pages, 1 page front cover, 1 page editorial, 2 pages of advertisement, 1 page SRD, 1 page back cover, leaving us with 7 pages of content, so let’s take a look! Well, first things first: Dawnmarsh is playing against the classic trope of the isolationalist, xenophobic lizardfolk tribe – instead, the lizardfolk of Dawnmarsh are actually welcoming trade, dealing with rare remedies etc. – this opening is not happening unopposed, with particularly the non-lizardfolk populace being welcomed into the village being too much for the more conservative elements. As such, there is some internal tension going on in the lavishly-mapped AND illustrated village. Yes, we actually get an impressive b/w-artwork to represent the settlement. The spiritual leader, Kassarin the wise, the venerable lizardfolk cleric, is one of two NPCs of note that comes with a fluff-centric write-up, noting no stats, but dressing habits, distinguishing features, etc. It should be noted that the pdf has been properly adjusted to refer to old-school aesthetics, with class-references etc. adjusted. Now, as always, we get more than that: We do have a total of 6 different whispers and rumors to help PCs that do their legwork. Similarly, village lore may be unearthed and local color is added via nomenclature, dressing habits, etc.. The lizardfolk worship the sun deity (makes sense, lizards and sun and all) and thus, this also is a part of the local culture and customs. If the basic set-up does not suffice your needs to make this as spontaneously useful as it should, well, rest assured that no less than 12 events/village dressing encounters can be found within, adding some life to the settlement. Of course, we do get a properly depicted general market-place section. Really cool: The write-up for the surrounding locality provides an optional tie-in with Raging Swan Press’ classic Tribes: Lizardfolk of the Dragon Fang-supplement – combine both for one aggressive and one conservative tribe, whose agendas may well be on collision course! Downside here: This optional tie-in pdf has not yet been converted to a system neutral version. While no fault of the pdf, the fact that the reference is still here may be a bit jarring for old-school gaming groups. The pdf also follows the evolved Village Backdrop formula that was pioneered in Needlebriar and made possible by the success of raging Swan Press’ patreon: While we still get write-ups for the locations of note for the village, they sport the improved presentation and detail: We get brief pieces of read-aloud prose describing the key-locales in basically read-aloud text; services available and items sold are noted by locale and we actually also get mini-quests/adventure hooks for the respective key locales. Better yet, there are actually specialized events in two areas: 6 events for the market circle, 4 for the dawn shrine. The pdf also sports the mechanical effects of two different, unique elixirs sold in the settlement: One that makes you quicker and one that nets a slow regeneration of lost limbs, but also some lizardfolk-ish quality. Yeah, fans of spider-man will probably have a few ideas there. The elixirs have been properly adjusted to reflect old school-design-aesthetics. Editing and formatting are very good, I noticed only minor, cosmetic hiccups. Layout adheres to Raging Swan Press’ two-column b/w-standard and is elegant and printer-friendly. Speaking of which: We get one version optimized for the printer and one that is optimized for screen-use. The b/w-artworks featured within are great and the b/w-cartography by Maciej Zagorski is really nice. A key-less high-res version of the map is, to my knowledge, provided to Raging Swan Press’ patreons. The two versions of the pdf come fully bookmarked with nested bookmarks for your convenience. David N. Ross is one of the few designers I know that excel at designing mechanically complex classes as well as writing great, referee-facing supplements. Dawnmarsh’s basic premise did not exactly blow me away. That being said, the execution is a whole other matter – Dawnmarsh greatly benefits from the improved, expanded village backdrop formula and is extremely easy to use. The reasons for the PCs to travel there, the politics and surrounding environments all conspire to make the settlement a really nice, fun place to explore. The system neutral version loses the cool tie in, but it would not be fair to penalize the pdf for that. My final verdict will hence also clock in at 5 stars for this one. You can get this nice village here on OBS!